Image: National Institute of Diabetes and Digestive and Kidney Diseases, National Institutes of Health. The significant adverse effects on both morbidity and mortality of a tunneled dialysis catheter (TDC) are well-known. Despite these known adverse outcomes, 80% of patients in the United States initiate hemodialysis with a TDC. An arteriovenous fistula (AVF) is known to have superior outcomes compared to all other forms of vascular access with regards to hemodialysis; however, many fistulas fail to mature into a usable and function access. This aspect of an AVF often goes overlooked in the pursuit of eliminating a TDC. Early clotting of the fistula following surgical creation (also known as primary failure) and failure of the fistula to mature (maturation failure) such that it cannot be used for hemodialysis remain major issues. Primary failure occurs in at least 1 in 4 created fistulas; one in 5 fistulas is nonfunctional at 1 year despite interventions to restore patency. 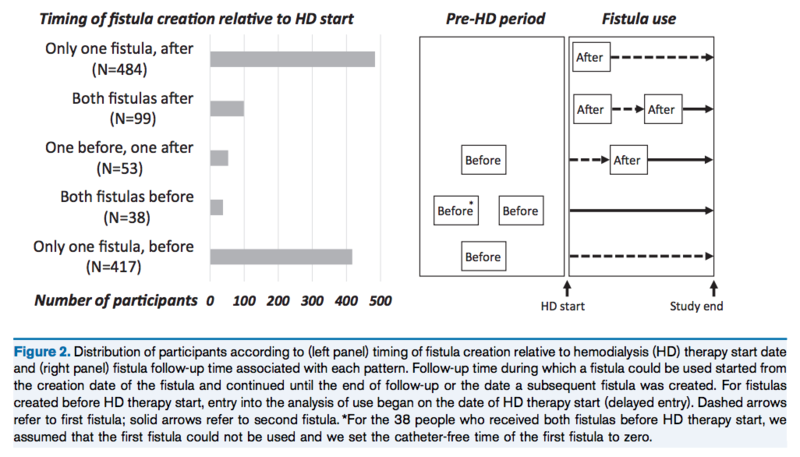 In a recent study published in AJKD, Kamar and colleagues investigate the outcomes of the initial versus secondary AVF by examining a Canadian cohort of hemodialysis patients who underwent at least one fistula creation attempt. They evaluated catheter-free use of first versus second fistulas and in patients who received one versus those who received two fistulas. They also assessed whether use of the first fistula predicts successful use of the second fistula in people who received 2 fistulas. Study cohort derivation. Fig 1 from Kamar et al, AJKD, © National Kidney Foundation. A 50-year-old patient with CKD stage 4 due to diabetic nephropathy has an AVF placed when his eGFR is 18 ml/min. After 6 months, the access has failed to mature, and the vascular surgeon performs another procedure to improve collateral flow. After another six months, the AVF is still not ready to be cannulated. The data from this paper can help providers and patients make an informed decision on whether another fistula, or an alternative access, should be pursued next. Fig 2 from Kamar et al, AJKD, © National Kidney Foundation. 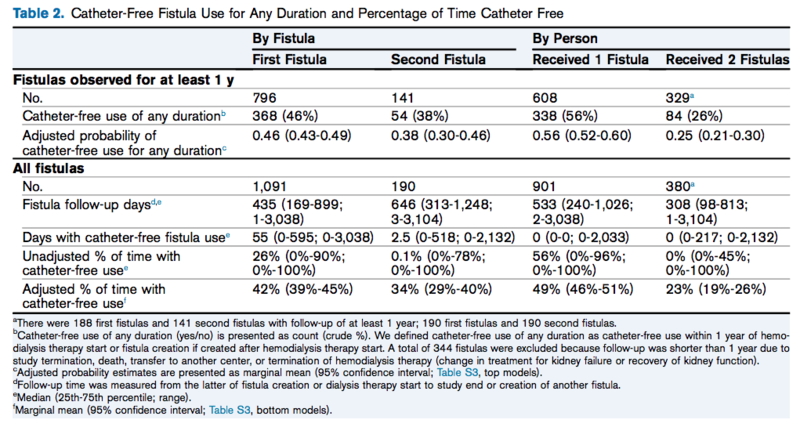 As compared with first fistulas, second fistulas were half as likely to be used catheter-free at 1 year after creation and 30% less likely to be used catheter-free during follow-up. Patients who underwent 2 fistula attempts remained catheter-free for about one-fourth of the follow-up time versus half for those with 1 fistula. Although use of the first fistula was associated with use of the second fistula, this association was weak. Table 2 from Kamar et al, AJKD, © National Kidney Foundation. As a nephrologist I spend a significant amount of time counseling patients regarding the benefits of an AVF versus a TDC, urging patients to avoid initiation of hemodialysis via a TDC. For those patients with a TDC, I focus my efforts on TDC elimination and AVF creation, but I do so without providing statistical outcomes for the likelihood of achieving the ultimate goal of catheter-free use. Patients should be informed that the probability of catheter-free use of the initial access is approximately 50% and that of a second fistula, if attempted, is lower at 34%. In order for patients to make a truly informed decision with regards to vascular access, they should not only be informed of the adverse effects of a TDC but also the probability of an AVF leading to the elimination of a TDC. To view Kamar et al (subscription required), please visit AJKD.org.